Petrol and diesel prices have been hiked for 15 days in a row, despite a decline in the rates of crude oil. 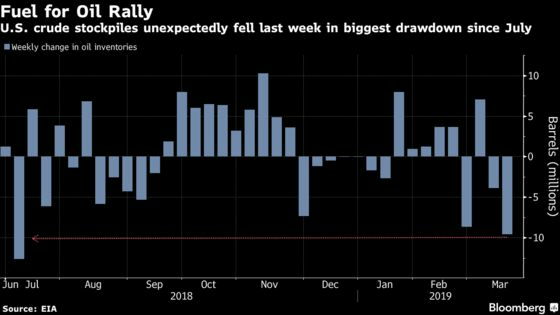 (Bloomberg) -- Oil closed at a new high for the year in New York after the biggest withdrawal of crude in U.S. storage tanks since July signaled further tightening supplies. Futures gained 1.4 percent on Wednesday after a 9.59 million-barrel decline in American oil stockpiles reported by the government exceeded analysts’ expectations. U.S. crude exports were near a record high while imports from Saudi Arabia decreased by more than half and Venezuelan crude imports to the U.S. stopped altogether. Domestic inventories of gasoline and diesel also shrank, indicating continuing strong demand. Firefighting crews early Wednesday extinguished a petrochemical tank fire near Houston that had blazed for almost four days. The reshaping of the oil industry over the past five years -- driven by the shale boom and the deep price slump -- has put the major international companies back on top, says Goldman Sachs Group Inc.